At a special meeting of the City of Liverpool Council on 3rd March 2010 the City Councillors awarded FREEDOM OF THE CITY to Pain Relief Foundation, which will now be included on the City’s Freedom Roll of Association, the highest honour that the City can bestow. 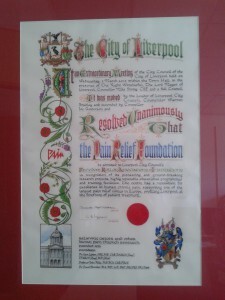 Speaking on behalf of the Trustees of the Pain Relief Foundation, the Charity’s Administrator expressed his grateful thanks to the Lord Mayor, Party Leaders and Members of Liverpool City Council for awarding the Pain Relief Foundation the City Council’s highest honour, and inclusion on the Freedom Roll of Association. He went on to say how delighted everyone at the Foundation is for this recognition and to have been awarded this prestigious honour. 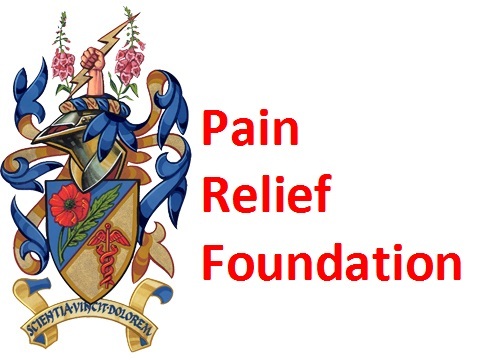 The award is in recognition of 32 years dedicated work on human chronic pain during which time, the Foundation has established an International reputation and is recognised worldwide as a leader in this field. Of course, our continued success is due to the combined skills of our doctors, scientists and researchers who work with drive and determination to further understand the underlying reasons for chronic pain conditions. Led by a Professor of Pain Science, the researchers seek to find new and improved ways to bring an end to the agonies suffered by the many thousands of chronic pain patients. Besides being supported by a Professor in Pain Science, the team is also supported by an Educational Committee and a Scientific Committee, each chaired by leading doctors. We would like to acknowledge that without donations and support none of our achievements would have been possible. We rely entirely on the unselfish gifts from our donors, on the goodwill and generosity of companies and trusts and on those who leave their legacies to the Foundation. We would like to offer you our sincerest thanks and gratitude. Human chronic pain is one of the last great challenges facing medical science, so please give us all the help you can to make sure it is a fight we can win! !